Slaughter Movie House and Screenland Armour teamed up to bring KC an older horror on the big screen. We plan to make this a monthly event. 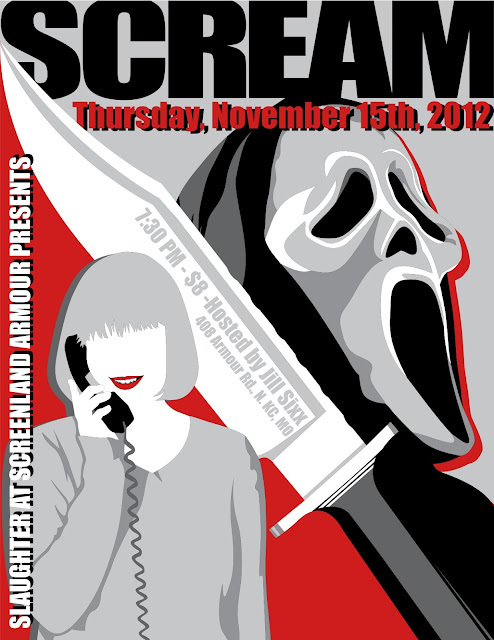 To continue with the slasher theme, we screened Wes Craven's classic 'SCREAM '. 'Scream' is one of my all time favorties and brings back a lot of very good memories. It is the the movie that turned me into a nerd about horror. Craven teaches the viewer so much about the genre in this film. I remember researching the internet and learning about all the references from other films, because they flew past me. I made a list of those films and started renting them one by one. 'Scream' brought back the teen slasher in the mid-nineties, which spawned movies like 'I Know What You Did Last Summer', 'Urban Legend' and tons more.